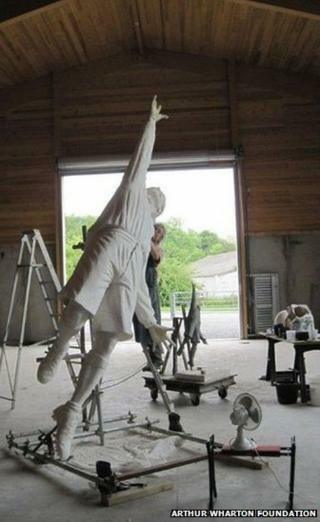 A statue of England's first black footballer is to be put up at the National Football Centre in Burton-on-Trent. Arthur Wharton came to the UK from Ghana in the 1880s and was signed by Darlington at the age of 19. He went on to play as a goalkeeper for Preston North End, Rotherham Town, Sheffield United and Stockport County. The 16ft (4.8 metre) bronze statue is due to be unveiled at the centre in Staffordshire in May. Wharton moved to Darlington with the intention of training as a Methodist missionary but opted instead to become a full-time athlete. In 1886 he became the Amateur Athletics Association's national 100-yard running champion, before turning to football. He died in a workhouse sanatorium in 1930. The statue, by acclaimed sculptor Vivien Mallock and commissioned by the Darlington-based Arthur Wharton Foundation, was originally intended to be erected in his home town. But foundation founder Shaun Campbell said the opportunity to have it at the National Football Centre was a testament to Wharton's importance in the sport. "We are hugely honoured and privileged to have received such fantastic support from the FA throughout our campaign helping raise awareness of Arthur's achievements," Mr Campbell said. FA chairman Greg Dyke said: "We're delighted not only to give Arthur a permanent home but to tell his story. Everyone who visits our wonderful facility will learn of his significance historically, and his remarkable achievements." The statue will be flanked by education materials, including a film and exhibition on the significance of Wharton historically and in 2014. A second statue is due to be put up at the New York Stadium, home of Rotherham United, later in the year and a further sculpture is also planned for Darlington.